Bootstrap has again joined forces with our friends and neighbors Boston Organics to lick wastefulness. This easy-as-pie promo (ingeniously dubbed The Green Plate Club) serves to bind the ties between two locally owned businesses specializing in organic produce delivery and organics pickup, respectively. Together—with your help — we’re reshaping the loop of food production, consumption, and refuse. So what’s in it for me, you ask? As a Bootstrap subscriber, you’ll receive $10 off your first Boston Organics delivery and a pair of Bootstrap pickups (a prize package worth up to $30!!). Clearly, if the notion of receiving fresh organic produce right to your door ever appealed to you, now is the time to enroll! 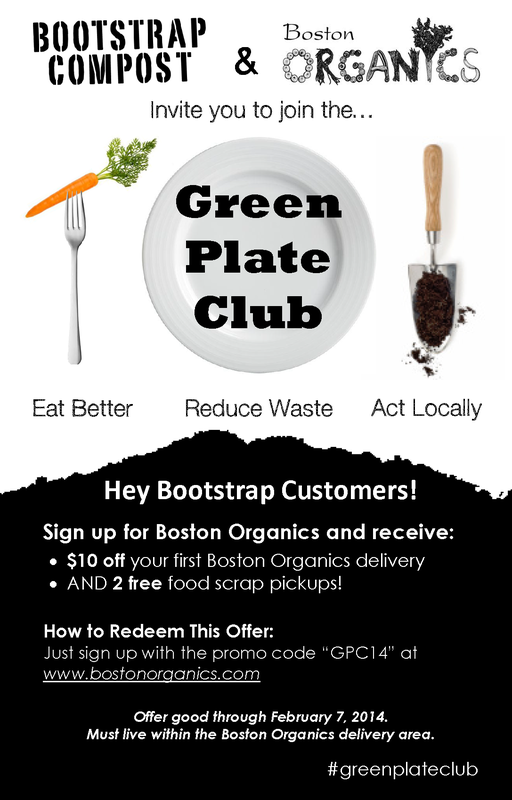 To join the Green Plate Club, sign up with our pals at bostonorganics.com with the promo code “GPC14.” If you feel like spreading the joy online, our hashtag is #greenplateclub. The offer is good through Feb. 7, 2014. For an inside look into Boston Organics and their philosophy, check out the video portrait below created (coincidentally enough!) by BSC co-founder Igor Kharitonenkov.